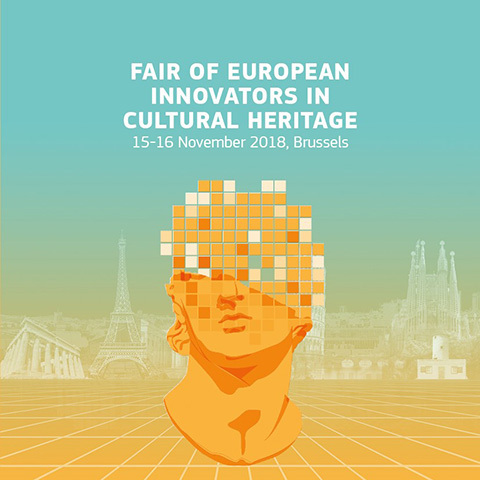 The CLIC project has actively participated in the Fair of European Innovators in Cultural Heritage held in Brussels, the Egg, on 15-16 November 2018, launched by the European Commission and aimed at promoting EU funded research and innovation projects in the field of creative culture. Two inspirational days of discussion and networking which gathered about 400 participants and more than 40 breakthrough innovations in the fields of tangible, intangible and digital cultural heritage. The Fair was on one side offering a venue to projects to promote their achievement and goals, enhancing their cooperation and exchange opportunities, on the other side pushing the discussion in the field through the contributions of international experts and organizations to advance the merge between creative industries and culture. The focuses of the event were put on the future innovators and change-makers in the cultural heritage and the conditions for them to improve their projects, imagining open multidisciplinary innovation ecosystems. CLIC displayed its potential in associating the theories on cultural valorization with the possible future scenarios in the circular economy, linked to the adaptive reuse of materials, techniques, technologies and all the small and medium size businesses related opportunities. Two CLIC Innovations were presented at the Fair: CHIA Circular Heritage ImpactAssessment services and toolkit, developed by IRISS CNR and the UHDF Urban Heritage Development Fund developed by UCL. A final publication on Innovative solutions for cultural heritagecollected the operational results of the Fair. The Fair hosted the High-Level Session on “Circular business and financial models for adaptive re-use of cultural heritage in cities” with a speech of professor Luigi Fusco Girard, CLIC Scientific Coordinator. This event was also the occasion for the launch of the Task Force on “Circular Business and Financial Models for Cultural Heritage Adaptive Reuse”, established by European Commission Executive Agency for Small and Medium-sized Enterprises (EASME) and DG Research & Innovation (DG-RTD) in close cooperation with the CLIC partnership. Another powerful tool for the dissemination of R&I results and creation of synergies among stakeholders in the cultural sector which was introduced at the Fair was the web-platform Innovators in Cultural Heritage, a virtual environment where innovators can share experiences and ideas, present results and products and find new opportunities of collaboration.